I thought I was done with that life – those days in university that included late nights writing papers, a caffeine addiction that enabled the aforementioned late nights as well as 8 am lectures. Not to mention sharing a bathroom with three other girls and dining hall food. But here I am, back on campus. This time, I'm at a university in China to learn more about the cross-cultural work SIM is doing on campuses and what it means to live life with students. Thomas and I are late for his 8 am lecture (my fault, of course). All of his students are already there, seated and ready, notebooks laid out and pens plucked out of pencil cases. Travel mugs of hot tea line the long desks, some with tea leaves still suspended in them. Thomas is an SIM cross-cultural worker involved with campus outreach, and he teaches at a local university in China. He reviews the previous lesson and assignment with his students, eventually calling on a specific student to answer a question. I feel a stab of sympathy for her as she stands nervously with her head ducked and reads her answer. The question was about benefits employers should provide their employees, and her answer sounds like it’s copied straight from the textbook. “And what do you think?” Thomas prompts when she is finished. She stammers nervously and dips her head to hide behind her paper and recites the same answer. I feel another stab of sympathy for her, and thankfully Thomas opens the question up to the rest of the class. There is discussion, but nearly all the answers have that same textbook feel. Her struggle to answer might be perplexing to people trained in a different educational culture – as a Westerner it certainly took me by surprise. A common critique of the education system in China is that students aren’t taught to think critically, that they memorize the right answers, never learning to think for themselves or think creatively. That explanation is too broad to affix to a nation’s entire student population, even if there is truth to it. But when the prevailing worldview is collectivism, as it is here, voicing one’s desires and thoughts and questioning authority is not considered a strength as it is in more individualistic cultures. Rather, group harmony, unity and a respect for those in authority is seen as the most virtuous path. For a wild second I think final exams must be coming up, before I remember that today is the first day of school and it’s barely half past nine in the morning. The main campus library at this Chinese university is packed. There is hardly an empty seat and students are quite literally camped out. Stacks and stacks of books form barricades around the students. Empty mugs of tea litter the tables, blankets are tossed over the backs of chairs, and one student has even brought a small plant to improve her little work station. He doesn’t need to convince me. I’ve seen sleeping bags in the library during my university days, but that was during final examinations. Never on the first day of school. I’m told that the students have been studying this way – strained and anxious – for most of their lives. In China, students spend years preparing for an exam, called the gaokao, at the end of high school that will determine the rest of their lives. Sound dramatic? It is, but there’s no exaggeration in that statement. 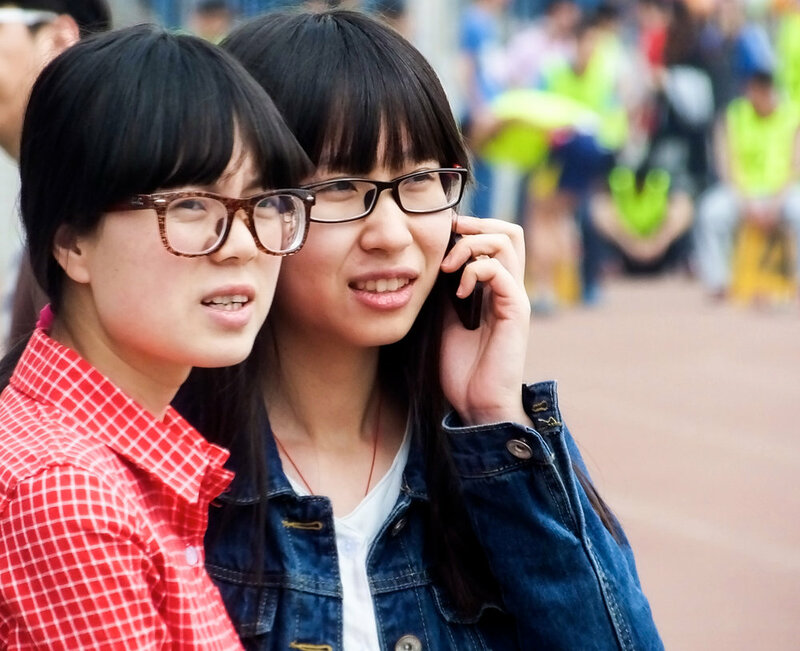 (There is speculation that the gaokao is the toughest exam in the world.) Children are raised from a young age knowing that this test will dictate which university they will go to. The top universities will only deign to admit those with the highest test scores, and the better the university, the better job opportunities and income. "Students who don't make it into good universities can feel labelled and doomed to a lesser life," says Helen, who has been involved in student ministry for over a decade. "Students who get into good universities can feel they've made it, only to discover they are only one among many others and are not really that 'significant'." And to think I thought the SATs in America were bad. Catherine and Helen are two of Thomas’ fourth year students, whom he has asked to show me around the city. They’re generous-hearted and kind; the fact that they took time off from their studies to show a stranger their university town speaks volumes to me. They insist on paying for the street food and snacks that I try (and I want to try everything). Catherine has an LA Dodgers baseball cap, and we talk about American pop music. They’re good friends; neither of them have siblings because of China's one-child policy (which began to be formally phased out in 2015), so the university student lifestyle (hanging out at random hours, living so close to them, etc.) is a welcome change. I ask them what they want to do after university. Get a high-paying job, they say. Maybe work in the States for a while. From what I can tell, it’s the standard answer, because it’s the standard expectation in their society. Passing exams and making money might be the goal, but the underlying motivation is all about family. Honoring one’s family is highly valued, so there is little room or opportunity to thoughtfully question the high expectations of their elders. Children are also expected to take care of their parents in their old age so a well-paying job is necessary, especially since many of these students are from one-child families. "Many parents will actually be the ones that organise their kids' future employment through their network of relationships. Students find huge pressure in this area - and are torn between filial piety and their own desires," says Helen. 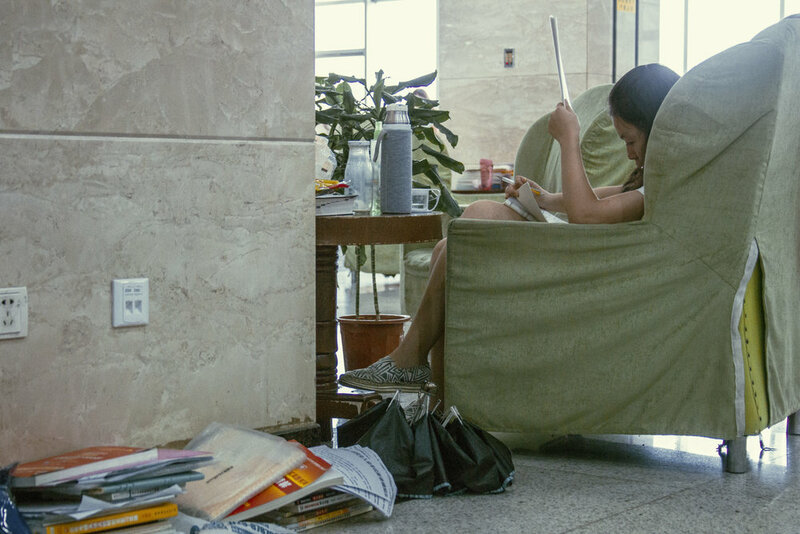 As much as these students’ time on campus is the manifestation of their familial and cultural expectations, it is also a unique time when many are living in a new place on their own and can explore new ways of thinking. I visit a weekly Bible study that is open for both believers and non-believers. This kind of space is vital in campus outreach, not only because it is a space for people to talk about God and Christianity, but because it offers students a break from academics. English corners are the same way – the one we visit is set up like a cafe, with plenty of couches and low tables that are best used for conversation and good company, not textbooks and flashcards. “We realize people take a long time to overcome obstacles to Christianity, so we just try to provide an environment where week by week, they have a supportive environment to experience Christian community,” says Thomas. He tells me about Steve, a student who has been coming to the study for years and still has difficulty accepting the validity of God because he adheres staunchly to evolution. Thomas and Allison are not trying to force Christianity on their students, nor are they asking students to reject their families’ expectations. Rather, they are trying to make space for the students to figure out what they want from life, and not what they are told to want. It is easy to assume these students can’t think for themselves, but not think creatively. One of Allison’s frustrations and points of cultural dissonance was exactly that, at least in the beginning. “They have imagination, but sometimes language ability, shyness, and a fear of losing face can limit what we see of it,” she says, noting she has tried to encourage the students to think more critically and imaginatively by building certain activities into her classes, such as riddles and even poetry writing. "What I have seen is that Chinese millenials are becoming increasingly individualistic compared to previous generations, and so they think more about what they actually want in life, instead of just listening to family expectations," says Helen. "But this can be an area of great struggle for some students." Still, even if students are deciding what they want, that may not include Jesus. "I hear a lot of students say how good it is to have a faith, people are realising that a life focused on purely material things brings about many problems in society and has a certain personal emptiness," says Helen. "But I think it is hard for them to see Christianity as the only one truth...and in general they are probably more likely to gravitate to Buddhism, as it is still the dominant religion in their culture and families. "It is incredible how much has changed in this country in the past five to ten years. Students have much more disposable income and many things to absorb their time and energy," Helen adds, alluding to the rapid development of China in the past decade. "I see many students are still mainly pursuing materialstic things, instead of really pursuing spiritual truth." But it isn’t enough to just tell the students that there is a life outside of school and a higher purpose to life – there must be proof of that. Thomas calls it the “value of integration,” meaning Christians don't just talk about God's love, but live it out. As a teacher on campus, he says, even just treating students fairly and equally is a change from what they usually experience. “I used to think that campus ministry meant you always had to be on campus,” Thomas says about his earlier days when he did campus outreach in his passport country. “But I have to be practical, I have a family and children. So you’ve got to integrate it with your normal life. “I invite students into my home, and that has an impact. It creates a sense of openness. If you’re able to open your house and provide a sense of warmth and family, that’s really wonderful to them,” he says. Several students even came to his home for a Christmas event at which he shared about the Gospel, even though – as he found out later – they had a major exam the next day. Allison agrees, saying that asking them how they are doing and being friendly and open with them makes a difference. She has a weekly “free talk” open to all her students and says there are a few who show up regularly. “Sometimes it’s just chit chat, other times it's about deeper matters,” she says, “and I've been able to listen to their struggles, dreams, and hopes and also share about my beliefs and my life outside university. To watch people like Thomas and Allison do their work, I see how opening these students to the Gospel is not so much about going to Bible study with them or asking them for their thoughts on religion, but opening them to relationships founded on trust and care. It is about opening up their lives, spending time with these students during a season of life in which they feel the pressure of familial expectations but also the desire to live in community with their peers and build friendships. Perhaps Allison and Thomas, and the many other Christian cross-cultural workers in China will never see students come to know Jesus and accept him as their God. But all this counts for something: these acts of kindness and hospitality, these times spent in conversation and relationship with students during a season of life in which they attempt to live out the expectations of their families but also desire to live in community with their peers and build deep friendships. These things are done with Christ's love, and that always counts for something. After all, university isn't just about grades and your future career, nor is it just a time of hours at the library and roommates that might not do their dishes. At university, there are all the other things: making new friends, meeting people who challenge your way of thinking, and finding a deeper sense of self. There is a need for more cross-cultural workers who have a passion for student life and campus ministry. If you are interested, please click the "Get Involved" button below! Photos (from top): Cover photo courtesy of Matthias Rip, by Allison, Violet Chiang, Violet Chiang, Thomas, Violet Chiang.